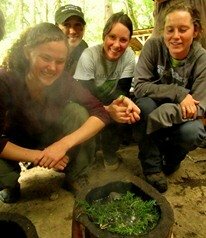 Knowing how to sharpen a knife is an important survival skill. A knife is the most essential tool to have on your person in a survival situation. Having a knife is the first step in the process of providing the essentials of survival (shelter, water, food) to a person stranded far from help; and like all tools your knife is most effective when well-cared for. One of the most important aspects of knife care is keeping a sharp edge on your blade. A sharp knife is not only more effective as a tool, but is also safer than a dull knife due to the fact that you need apply far less pressure to cut with a sharp blade. There are multiple methods for how to sharpen a knife both in terms of sharpening tools and the techniques used. 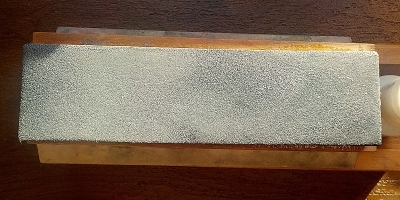 A whetstone is an effective, and widely used method that with the right techniques will consistently lead to a sharp effective edge on your cutting tool. 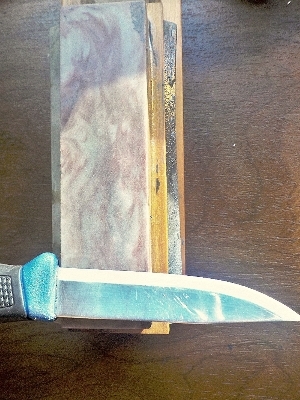 Whetstones use a liquid such as water or honing oil to keep the metal shavings taken off your knife from clogging the stone and minimizing its ability to take off further material from your blade. 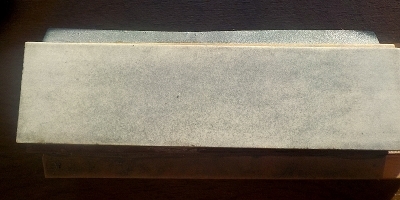 If your knife is dull (needing more than a quick touch-up) you will begin the sharpening process with a coarse-grained sharpening stone (see below). The coarse stone will take off more material than a finer-grained stone. Later on, move to a stone of a finer grain which will allow you to add a sharp finished edge to your knife. Another important principle to keep in mind when sharpening a knife is making sure to keep a uniform angle as you sharpen (usually between 15-20 degrees) and to apply firm steady pressure on your blade as you move your knife over the stone. In order to keep your knife at the proper angle a few household items are all that is needed. A 15-20 degree angle can be approximated in several ways. The first item that can be used is a post-it note that is folded twice; once opposite corner to opposite corner, and once from the diagonal fold line to the bottom of the note. This techniques forms a “ramp” that is approximately 22 degrees. Other items that can be used are two stacked pennies, a match book, and approximately half the width of your thumb. In order to make sure that you are sharpening the entire bevel of your blade take a sharpie marker and color over the bevel. 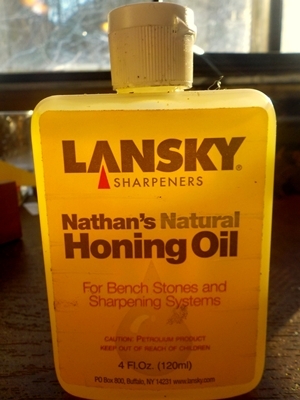 Next take one pass of your knife over the sharpening stone. After passing the blade over the stone check the bevel. If there is marker left on the very edge of the blade then your angle is too flat. If the marker is left on the top of the bevel then you are holding your blade at too steep of an angle. If your technique is perfect then you will be removing all of the marker from the bevel of your blade. 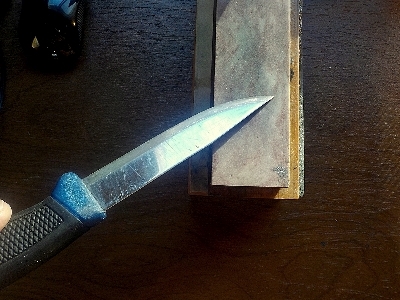 There are several ways to move the blade over the whetstone, and the one you choose depends upon personal preference. 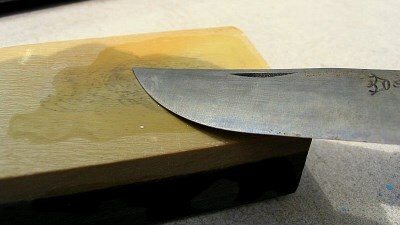 One way to move the knife is directly forward and back along the stone (see photo below). Apply gentle but firm pressure on the blade while moving the knife forward, and apply lighter pressure on the blade as you are moving back toward your body. When using this method you must move systematically down the blade from the hilt to the tip. The second way to move the blade over the stone is to run the entire length of the blade over the stone on each pass while moving the blade away from your body (see photo below). 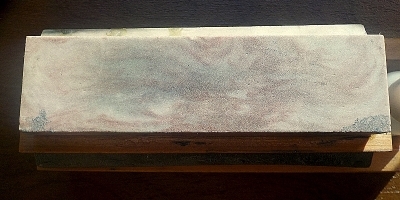 When using this technique it is important to make sure that the tip and the hilt of the knife are making contact with the sharpening surface and not just the central portion of the blade. The last method involves making circular passes over the surface of the stone. As you sharpen it is important to periodically check your work. 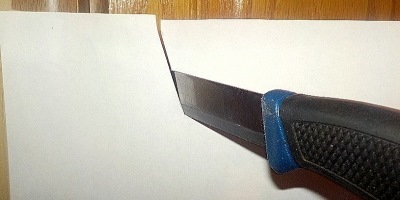 A sharp blade can cut easily through paper leaving a clean cut edge (as opposed to a ragged edge). A sharp blade can also slice through a tomato with very little pressure. Other methods that can be used is to try slicing cleanly through a wet sponge, and running the blade of the knife against the grain of your arm hairs. If the blade is sharp it will cut through most of your arm hairs on each pass. After you have finished sharpening the blade you may notice small metal pieces clinging to the edge of the blade. These pieces of metal are known as the burr and can give you the false impression that your knife is sharper than it really is. To remove the burr without dulling your blade you can run the edge of your blade on a piece of wood. Knowing how to properly sharpen a knife is a valuable skill, however you don’t want to be spending every moment having to practice that skill. Therefore it is important to avoid dulling or damaging your blade. Remember that when your knife comes in contact with an object that is harder than itself that object will dull the blade. Take care to avoid hitting the ground when working, or otherwise hitting the blade against objects on the landscape. Knowing how to sharpen a knife is an essential and individualistic skill. Experiment; find what works for you, and practice until you’re able to maintain your knives in top condition.